One of the major standards that you need to meet to boost your business is cleanliness. If you are a host and you want to connect with travellers around the globe, all you need is present your rental property according to Airbnb check out cleaning standards or beyond standard. When you’re able to do this, certainly, your accommodation will gain positive reviews, more rental bookings, and rental recommendations. On the other hand, if you have below average rental properties due to poor customer and maintenance management, it can decrease rental rate production. And that is due to poor customer or guest’s satisfaction. If you don’t give an urgent solution to it, it may lead to the risk of losing customer’s patronage and loyalty. And eventually, bring you to bankruptcy. Hence, to avoid this to happen, you need to make a preparation and turnover Airbnb checkout cleaning processes. With that action, your rental rate will increase which will show on your occupancy rate once it increases. But how will to be able to start Airbnb check out cleaning? There are strategic ways to upgrade your Airbnb check out cleaning. 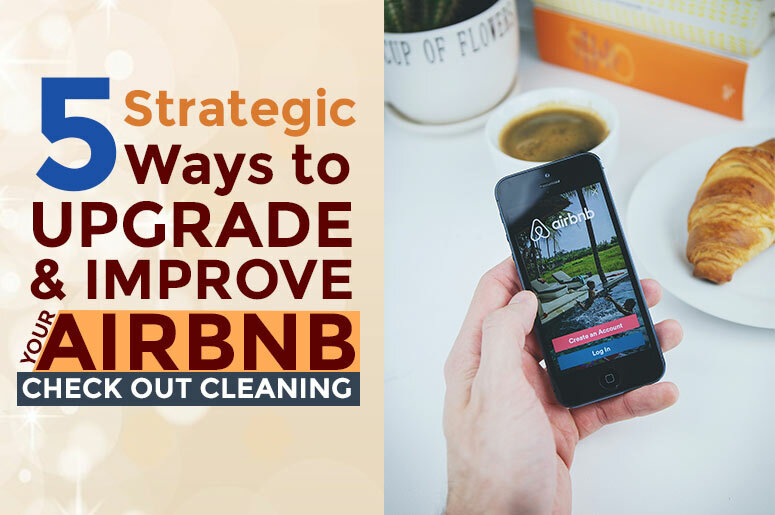 Below are some of the strategies that can help you resolve your problem when it comes to maintaining your business well-maintained, neat and organise with Airbnb check out cleaning. Hiring professionals to do Airbnb check out cleaning for your lodges or homestays can be very efficient. They can take care of the entire turnover tidying process once the guests left. Generally, the standard of service that’s required for every premise is high. So instead of hiring someone who’s not really good at tidying, the best option for you is to hire experts. The team who can do all the tasks just like how it’s done in full-service hotels and other establishments. Good thing, Maid in Perth has a reliable and hardworking people you need. Wherein results can give you and your guests utmost satisfaction once to get our Airbnb check out cleaning services. Adequate stocks and supplies are important to sustain the needs of your guests. This is part of their standard whether your business deserves positive ratings and reviews that can give you the benefit of increased rental bookings. Consequently, each one of them can certainly notice things that you’ve missed to provide them during their stay. Thus, it’s better to avoid negative guest comments or feedback by ensuring that you keep adequate items and check your stock room from time to time. Your Airbnb check out cleaning maintains your property’s fresh and tidy looks. One of the strategic ways to prepare for your guest’s stay is keeping it neat once in a while. Although this kind of cleaning seems voluntary on the part of the host, it can, in most cases, bring you great and positive feedback. It can also help you lessen the expenses you’ll for renovation since you prevent it from getting damaged by tidying every now and then. Apart from that, if you’re requiring to have a deep cleaning in one of your rooms, then Maid in Perth can provide it to you. This task needs to do tidying inside and outside parts of your fridge and oven, shampooing of carpets, wiping of baseboards and closet corners. As well as the tidying of your cabinets, bathrooms and other appliances. 4. Ensure adequate documentation for damages. Get notified of any damages for claims and reimbursement purposes. For better checking, the cleaners you hired can help you with this concern. Consequently, you’re allowing the damage to become worse if you miss dealing with this during turnover and tidying. Aside from that, this will also lead you to negative reviews with your future guests. So, you better look out to it. Knowing that you have settled damages before they can become potential future problems, certainly can give you immeasurable peace of mind. Positive guest experience would mean good management of guest’s bookings and their on-time payments. Once you’ve served your guests well right from the very start, it would always end up advantageous for you. For one thing, your guest will find your promptness and readiness in providing them with their needs. Another is, you have given them the best experience they can never forget. As mentioned, cleanliness is the major standard requirement for all Airbnb. This is needed if you desire to boost your business or increase your rental rates. And that requires you to go over with the strategic ways of upgrading and improving your maintenance and processes. In that way, you’ll surely gain all the 5-star reviews and thereby becoming an all-out successful in your business’ goals. Resolve issues now about your Airbnb rental property or business. We offer affordable Airbnb preparation and check out cleaning services. Visit our website and find the cleaning services that fit your cleaning needs. Take advantage of this offer NOW. This entry was posted in Cleaning Services and tagged Airbnb Cleaning, Check out Cleaning, cleaning.